You might think it’s nuts. But we’re nut surprised that Nutella has a whole day dedicated to itself. Whether it’s smeared on indulgent slabs of French toast or whisked into a shake, here’s where you can go all gooey over the chocolate hazelnut spread. Warning: may contain large quantities of nuts. Nutella on French toast is like a big ol’ warm European hug of a meal. Add Lotus sauce and salted pretzels and you’ll never want to let go. The thick slice of delight from JBR’s newest fast-food fusion joint is only AED 15. Until the 7th February, with orders of over AED 60, you’ll get this yumness in your tumness for free. 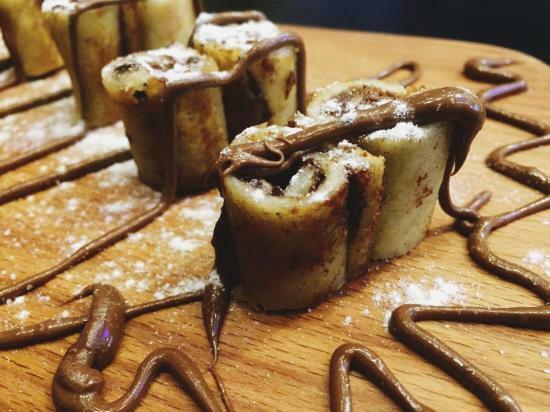 An actual Nutella Bar exists within The Dubai Mall. Sweeten up your shopping trip with a warm and crispy Nutella crêpe, fruit salad, or even a coffee with Nutella. Dishes start from AED 23. Take your quest for Nutella to Al Quoz Pond Park and unlock these end-of-level prizes – delectable milkshakes served in a giant Nutella jar, Nutella parathas and sundaes. Service is direct to your car, as there’s no seating, so you can hoover up the chocolately goodness in private, and wear that milkstache with pride. From AED 20. Behind Al Quoz Pond Park, Meydan Road, Al Quoz. 050 108 01716. 9.30am-1am daily. Also in Financial Centre Metro Station; Dakakeen Mall in Mirdif and Nad Al Hamar Avenues, Ras Al Khor. Blinged up sweets from this new Canadian ice-cream joint in City Walk include a peanut butter, pretzel and Nutella frappe for AED 42. Even though it’s technically winter in Dubai, add a cold brew shot for AED 10 to prove your Canadian credentials. City Walk. 10am-10pm weekdays, 12am Thursday/Friday/Saturday. 04 349 9917. IT’S ALIVE… IT’S ALIVE. OK, it’s technically not alive, but this fun fusion Frankenstein-esque sushi is served with a hefty dose of Dubai nostalgia. You can visit Moshi for the momo (dumplings) and sushi (see what they did with the name there) but you can’t leave without trying the Nutella Maki (AED 26). Unless you suffer from a nut allergy, in which case you’ll have to trust us on the ‘mmmmm’ noises. 11am-midnight daily. Oud Metha Building, Near Lamcy Plaza. 004 526 9273. Also in Al Barsha. 04 399 9650. Eye-catching and affordable, Shakeism takes inspiration from the big screen for many of its slurp-worthy milkshake blends. Full Metal Jacket mixes up Ferrero Roche, Kinder Bueno and, of course, Nutella, in one creamy thick-scooped blockbuster (AED 23 – for the small size, AED 29 for the large). Al Mina Road, Next to Mercure Gold Hotel, Satwa. 11.30am-2am daily (1.30pm Fridays). 04 325 5360. Also in Al Barsha and Dar Wasl Mall, Al Wasl Road.